Also Recommended: Nausicaa, Green Legend Ran. In a post-apocalyptic future, the forests have awaken and trees have become the dominant species on Earth. Most of humanity resides in one of two cities- the peaceful Neutral City and the militant Ranga. Relationships between the two have already been strained, but when a girl from the pre-apocalyptic past named Toola is awaken by Agito, a boy from Neutral City, things grow rapidly worse. Toola may hold the key to returning the Earth to the way it was, and Colonel Shanuk from Ranga will stop at nothing to make sure that happens. This is an introductory paragraph. This is the part where I start my review by writing some catchy sentence, a funny anecdote, an observation or some oddball remark to get your attention. This is where I expand on said anecdote/sentence/observation/remark, hopefully drawing a giggle or two from you and get you interested in finishing the rest of the review. 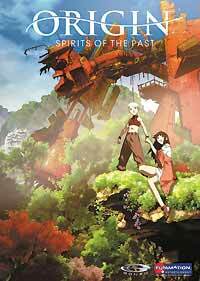 And here is the part where I cleverly tie the anecdote/sentence/observation/remark to the anime I am reviewing today, which happens to be Origins: Spirits of the Past. This lets you know not only what you will be reading about, but it also lets you know just how darned creative and abstract I can be. After all this comes the part of the review you've probably already read: the synopsis. I will try to make it interesting by not copying and pasting the original synopsis, like I am tempted to do sometimes. Fans of An Inconvenient Truth would know that humanity has done some pretty nasty things to the Earth. In Origin: Spirits of the Past, the Earth gets its revenge when a science experiment gone terribly wrong "awakens" the forests. Nature soon reclaims the Earth, forcing humanity into small cities that either co-operate with Nature or try to fight against her. Legend says there is a buried technology that can return the planet to human control. When a girl named Toole is awakened from the pre-apocalyptic past by our hero, Agito, that technology is suddenly in the grasp of the militant city of Ragna, who will stop at nothing to see their goals fulfilled. Now, Origins isn't a bad film, but it's a few fries short of being a four star Happy Meal. I'll go through which fry it is missing one by one, but first I'll start with the big one: it's too dry. What I mean is it's so plot driven it never stops to smell the proverbial roses that are its the characters. Kinda like my introductory paragraph- all business, no flair. (See, I did have a method to my madness). I'll elaborate on this later, but for now let's count the fries this show does have. Some of them are actually quite tasty. The animation is, of course, great. It doesn't take us anywhere new, but it doesn't need to. The "vine-dragons" are especially well done CG- they look good without disrupting the rest of the movie with how good they look. I've come to expect this sort of thing from a feature length movie by GONZO, though, so let's move on to something more noteworthy. One of my favorite aspects of the movie is the protagonist, our hero Agito. Here is one of the few examples in anime of a hero who gets the job done in a manly, non-angsty way. He doesn't complain or whine, all he needed to know was that Toole was in trouble, and he gets straight to the action. And speaking of action, the fight scenes are pretty cool. They're smooth, well-animated, and absolutely ridiculous, like Agito single handedly taking out a tank. Just the kind of stuff I enjoy in shounen anime. Agito isn't the only interesting character in this movie. We also have his tagalong childhood pals, the cutesy next-door-neighbor who has a crush on him, and Colonel Shanuk, the deceitful leader of the movement to return Earth to its former owners. Oh yeah, and then there's Toole, but she's kinda bland. And since I personally didn't care for her, I won't mention her for the rest of the review. And with all those interesting characters, its frustrating that they take a back seat to the plot. I'm of the school of thinkers who believe that characters write the plot of a movie or novel, not the screenwriter or novelist. Origins gave me the feeling of dryly going from Plot Point A to Plot Point B to Plot Point C, which isn't very fun. I wish the screenwriter had stopped to take the time to explore some of the characters in the movie, and give them a little more room to grow. While there is character development in Origins, it's nothing unexpected and nothing special. I suppose that sums up Origins: "nothing special." I didn't say it's not original, it's just not quite the four star it could be. And while not every anime needs to be great art, it does only need to be entertaining. A large part of that entertainment in movies is a film's rewatch value. I liked Origins the first time I saw it, but would I watch it again if given the chance? Nope. See, that's another side effect of having a plot driven anime- it revolves around "what happens next" and once the viewer finds that out, it's not fun anymore. To sum it up, I suggest that if you're curious about Origins, or if the synopsis perked your interest, check it out. You won't regret it, but you probably won't watch it again either. Recommended Audience: Stylized violence and mild language is all you have to worry about.